We want to say thank all of you for your support of our judicial review challenge of NHS England. Today the Honourable Mr Justice Supperstone handed down his judgement, and it is with profound disappointment that I must share that the British Homeopathic Association has failed in its challenge to get NHS England’s decision to stop funding homeopathic medicines overturned. As you are aware the case was heard by the Honourable Mr Justice Supperstone at the Royal Courts of Justice on 1-4 May. The BHA’s main claims against NHS England were that the consultation misrepresented homeopathy and therefore was unfair; and a report used in the consultation to inform the public was so complicated it would deter rather than encourage people to respond. We knew we were in a David vs. Goliath situation, and that in the end it would come down to one judge’s interpretation of the case. 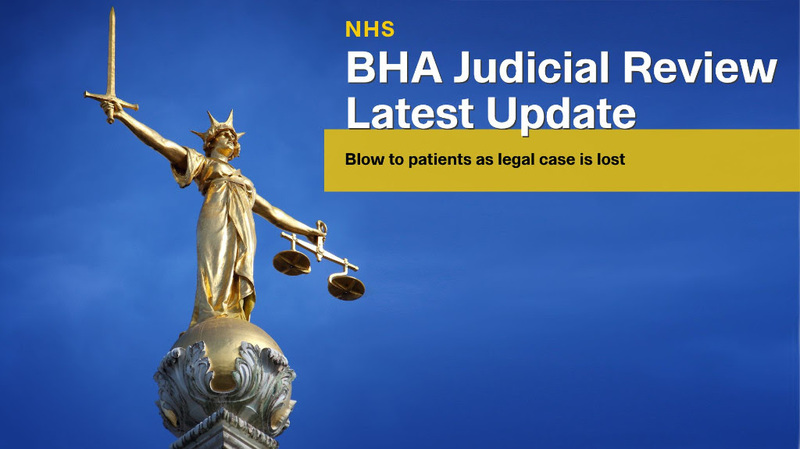 Although the judge found there were sufficient grounds for a judicial review, after four days of lengthy legal arguments he dismissed the claims against NHS England. The case highlighted for us how health bosses are unfairly manipulating the consultation process and making decisions about healthcare services without genuine patient engagement. That NHS England attracted fewer than 3,000 responses from patients to a three-month national consultation on 18 medicines highlights its failure to genuinely engage with the public on important decisions about healthcare provision. In contrast we had over 34,000 people sign our parliamentary petition to keep services in the NHS. Although 18 medicines were under review the only negative statement in NHS England’s press release promoting its public consultation was about homeopathy. The statement was so prejudicial it was widely reported in the media that the decision to deny patients homeopathic medicines had already been taken. How the judge failed to recognise that this was a deliberate attempt by NHS England to unfairly influence the public is astonishing. The only information about homeopathy that NHS England provided was an outdated report that was critical of the therapy. And although it did contain the case for homeopathy as put by scientists, doctors and patients, it is preposterous to think the public were going to read a complex report of over 275 pages to help inform their response to the consultation. It appears that NHS England can fail to engage with patients properly on removing services and get away with it. That is not good enough, for it is important to remember that the real losers in this case are the patients who are now being refused a treatment on which they have come to depend. Despite this disappointment, we remain committed to defending homeopathic services. We will continue to champion homeopathy’s health benefits, cost effectiveness and the right of patients to homeopathy for their healthcare needs. We know we did the right thing to stand up for patients and fight to protect homeopathy in the NHS.